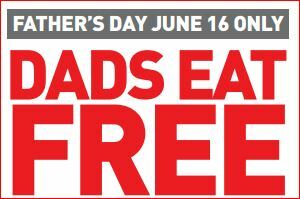 Dads Eat Free June 16th @ Spaghetti Warehouse!! Hey Dad! Instantly print THIS COUPON and bring it to your local Spaghetti Warehouse for a FREE lasagne or original recipe spaghetti! Find the Spaghetti Warehouse closest to you HERE!